The marketing world is based on building and enhancing relationships through communication to generate and maintain sales. However, every business, including marketing agencies, must adapt to societal changes to sustain and achieve each quarters goals and objectives by successfully using various communication techniques. It is a marketer’s newest side-job to stay up-to-date with communicative methods and learn how to use, and properly implement, them, as well as foresee and prevent potential problems that may occur using these new communicative efforts. As human interaction is becoming highly virtual, “transcending space and time,” marketers must consider their current methods of communication and learn to adapt to societal changes as they attempt to communicate to their target audiences (Flew, 2008). With the decline in face-to-face communication among businesses, communication with target audiences are conducted through alternative tactics. In the fast paced working environment, it is often found that businesses rely on convenient methods of communication, which is generally non-direct communication. As a marketer, it is crucial to get across messages in a timely, and effective manner, thus it’s essential for businesses to learn how to use cutting-edge methods of communication adopted by the mass public and use these tools in their efforts of proper and effective communication. In global businesses, meetings and focus groups with current and potential consumers are now implemented using online platforms. For example, Youtube has a video on How to Use Skype for Business: Video Tutorial, which explains the ease and benefits of using Skype to ensure communication between businesses and consumers (Skypemaster123, 2008). Skype and Apple’s FaceTime, are among two of the new communication devices that eliminates the idea that people have to be in the same space at the same time to communicate. Mashable’s inforgraphic, as seen below, regarding Inbound Marketing vs. Outbound Marketing, emphasizes that as “content is shared and spread through [various] networks… the reach of the content can grow virally,” (Durell, 2011). These communication devices allows for marketers to stay in contact with clients, and consumers, thus increasing their level of reach and impact, causing for an increase in brand awareness, brand loyalty and an increase in sales. However,as the number of devices and platforms increase in communication methods, it’s imperative to research ways of how to properly communicate, and prevent potential problems that may occur using these advanced methods. Using numerous forms of communication, including social media websites, can be confusing to new users, thus potentially generating confusion among the public about a business and its brand. 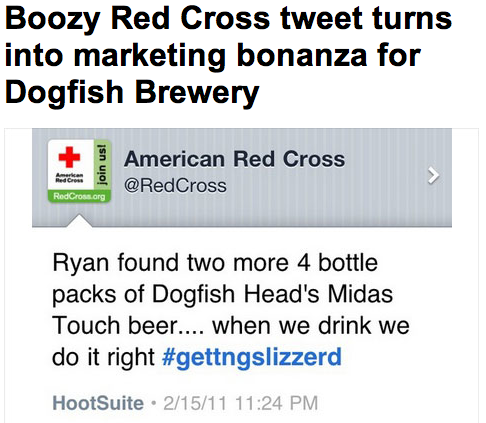 For example, an American Red Cross employee attempted to use Hootsuite, a social media platform where people can share information on multiple sites at the same time, and accidently tweeted about drinking on the company’s personal account rather than her own (Segall, 2011). This story is a great illustration of potential problems that could occur using new devices to communicate to target audiences, without the proper knowledge of how to use the device. According to Fox’s infographic, seen below, businesses should use “reputation- monitoring software to keep a close eye on how [employees] represent [a businesses] brand,” (Fox, 2012). Like the Twitter case, it’s important for businesses to know how to communicate and prevent from any mishaps that may occur, to protect their brand image at all times. With the rise in social media as a communicative device, it is highly suggested that marketers and businesses create a crisis plan in case of circumstances, like a mis- tweet. As marketers use social media, and other methods, to communicate with their target audiences, they must become experts in managing and properly using these devices to their advantage, not to their demise. Thus,it is vital for businesses to remain on top of trending communication methods to ensure that a company remains on the minds of their target audiences at all times. Flew, Terry. (2008). New media: An introduction. (3 ed., pp. 207-210). Victoria, Australia: Oxford University Press. This entry was posted in Marketing and tagged @mashable, @skype, Carolyn Spencer, CarolynNSpencer, marketing, online, social media. Bookmark the permalink. ← Cyber Law: Coming Your Way?